The Human Brain Project uses a new generation of three-dimensional (3-D) reference atlases as tools for analysing and integrating research data. The human atlases and one of the rodent atlases (WHS rat brain atlas) are developed and maintained by HBP. The mouse atlas is provided by the Allen Institute. All atlases are embedded in HBP workflows for data registration, visualisation, and analysis. An ultrahigh resolution 3D model of a complete human brain (20 micron isotropic resolution), developed in a collaborative effort between the teams of Dr. Katrin Amunts and Dr. Karl Zilles (Forschungszentrum Jülich) and Dr. Alan Evans (Montreal Neurological Institute). Based on 7404 digitised histological brain sections, this so far unique reconstruction provides unprecedented neuroanatomical insight. The dataset contains a complete grey and white matter classification with corresponding surface reconstructions (Lewis et al., OHBM 2017). 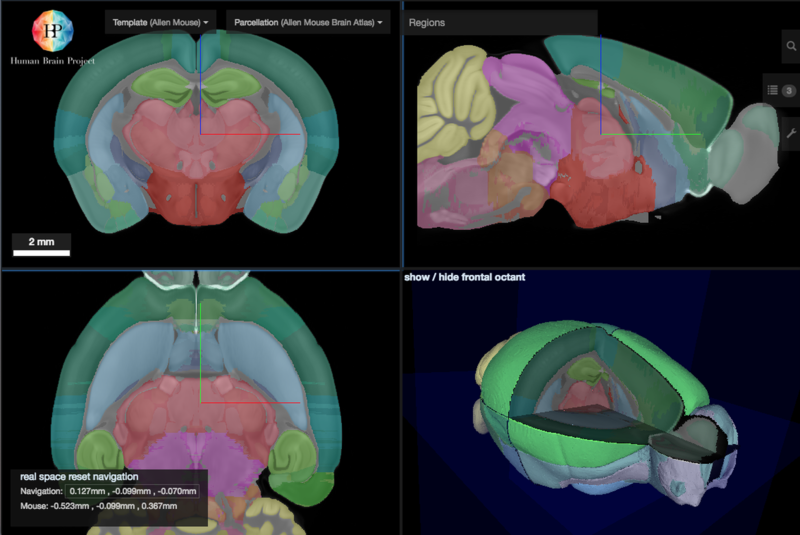 Explore the BigBrain high resolution human brain model online in the open source Neuroglancer viewer. Download the BigBrain dataset from Loris, hosted by the Montreal Neurological Institute. An atlas based on independent analysis of cytoarchitectonic brain areas in histological sections of ten human postmortem brains, based on image analysis and statistical criteria for localising areal borders, developed during the past 20 years by the teams of Katrin Amunts and Karl Zilles in Juelich and Duesseldorf . The individual maps have been aggregated by image registration methods in the MNI Colin 27 space to obtain probabilistic maps for each area. The parcellation shown in our atlas viewer represents the maximum probability estimate at each voxel in this space. Explore JuBrain online with the specialised Neuroglancer viewer or using Jülich’s cytoarchitectonic atlas viewer. The Waxholm Space (WHS) rat brain atlas is an open access volumetric atlas offering comprehensive anatomical delineations of the rat brain based on structural contrast in isotropic magnetic resonance (39 μm) and diffusion tensor (78 μm) images acquired ex vivo from an 80 day old male Sprague Dawley rat at the Duke Center for In Vivo Microscopy. Spatial reference is provided by the Waxholm Space coordinate system. 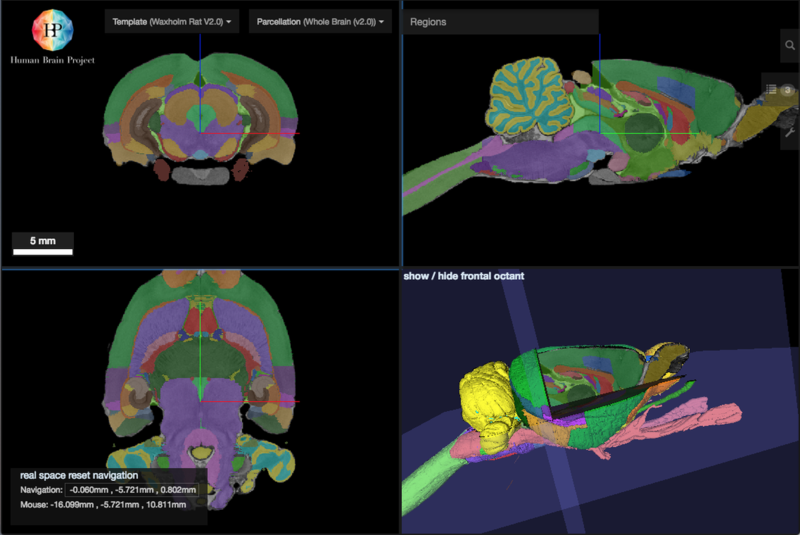 Explore the WHS Rat Brain Atlas online with the open source Neuroglancer viewer (beta). Download the WHS Rat Brain Atlas dataset from NITRC. The Allen Mouse Common Coordinate Framework (CCF) has been adopted as the standard HBP mouse brain atlas to view and integrate data from the mouse brain. The Allen Mouse CCF includes a full-colour, high-resolution anatomical reference atlas accompanied by a systematic, hierarchically organised taxonomy of mouse brain structures. 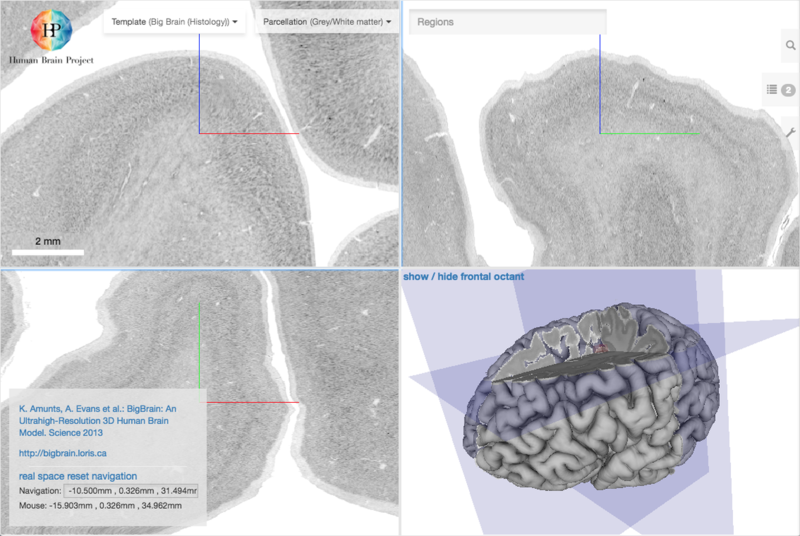 Anatomical annotations in classical histological atlas plates were extracted to create a comprehensive volumetric reference atlas of the mouse brain. Explore the Allen Mouse CCF online with the open source Neuroglancer viewer (beta).